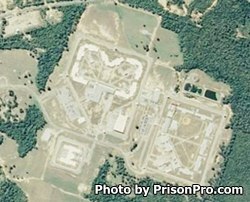 South Mississippi Correctional Institution is located in Leakesville Mississippi. The current capacity of this prison is 3,082 adult male inmates. Offenders at this prison can be classified as minimum, medium, close custody, and protective custody. Inmates are housed in 17 units. This facility also has a boot camp program called the RID or Regimented Inmate Discipline program. The RID program attempts to instill discipline, respect, and self-esteem through a boot camp like program. One of the distinct features of this prison is a 25 acre blueberry patch that inmates harvest. Offenders can receive substance abuse treatment, counseling, earn a GED and obtain an adult basic education. In addition multiple vocational disciplines are taught to inmates. General Population Units have visitation on Saturdays or Sundays depending on the unit, you will need to contact the facility for which day your inmate's unit can receive visits. Visiting is from 8am-2pm. Maximum Security C has visitation on the first Saturday of the month and the third Sunday of the month from 4pm-5pm. All visits for C are non contact and by appointment only. Maximum Security D has no visitation with the exception of attorney visits. RID offenders phase I and II have visits on the first and third Saturdays of the month from 8am-12pm, phase III and IV offenders have visits on the second and fourth Saturdays of the month.